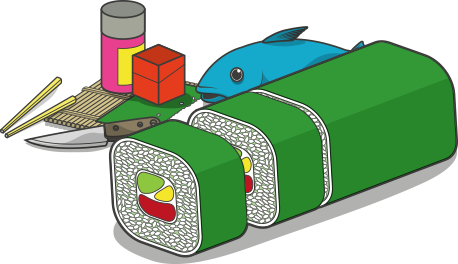 A novel way to add color and character to your sushi platter. This short how-to for our Carrot Slinky and Cucumber Garnish is an easy-to-follow, step-by-step guide to two different methods for these eye-catching garnish creations. Will you choose the easy way, or the hard way? Preparation: Dehydrate the carrot in a bowl of cold, salt water for around 30 minutes. This will cause the carrot cells to be displaced, making it far softer and easier to work with. The downside to this method of dehydration is that the carrot will taste salty, therefore it can only really be used for decorative purposes. 1. Hold the carrot in one hand, and line up the blade of your knife vertical to the carrot. Using a gentle, but swift up and down motion, begin to slice just beneath the flesh of the carrot, not more than a few millimeters below the surface. 2. Turn the carrot with your fingers as you work, taking care not to exert pressure with the knife as you slice. If the carrot is properly dehydrated, it should feel as if you are slicing through butter. If this is not the case, you may need to dehydrate the carrot a little more before you can work with it. Tip: It may also help your knife to glide more easily if you moisten the blade with a little water. 3. Once you have a full carrot sheet, lay it flat upon the chopping board. Using a sharp knife, cut a series of thin strips the full length of the carrot sheet. The thickness of these strips is down to personal choice, however thinner strips will curl more easily. 4. Next, wrap a strip of carrot around the chopstick, using the full length if necessary. Leave it to take shape for a few minutes as you prepare the next one. Gently remove from the chopstick when ready using your fingers. As above, due to the saltiness of the carrot, you will not be able to use this as edible garnish – only for decoration. Cut off one end of the cucumber, and then cut it in half. Stand the cucumber on its end, and using an apple corer, create a central perforation through the length of the cucumber. This is easily done by gently twisting the corer before removing it, however you may also find it helpful to dip the corer in a glass of water to help it glide through the flesh more easily. Hold the cucumber firmly in one hand, and line up the base of the blade of your knife with the top. Bring the blade of the knife through the flesh, using your thumb to control its speed as you rotate the cucumber. For an idea of appropriate thickness, you should just be able to see the knife through the flesh of the cucumber. Continue slowly rotating the cucumber so that the knife glides through the flesh of its own accord. You should now see a spiral beginning to form. Allow the spiral to rest on the chopping board once you have cut through a portion of the cucumber. This way, you won’t have to keep a finger on top of the cut spiral to stop it moving about as you slice. Cut until you achieve your desired length – or half of the cucumber section. plate decoration. However, there is a specialist sushi garnish machine available – and it’s quite affordable. It features a number of add-on blades for creating different effects, coupled with a vice-like mechanism to hold your vegetables in place. Simply place the vegetable in the vice and secure it in place, then turn the handle and see your cucumber or carrot transformed into a perfect long spiral. Use of the sushi garnish machine also means you won’t have to dehydrate your carrot, as the blade is sharp enough to glide through it without the need for softening. Tip: You can also use the sushi garnish machine for potatoes to create ‘curly’ fries. Simply feed the potato through the machine using the flat blade attachment; sprinkle with paprika, and immerse into a deep fat fryer.